Young people galvanised by the massacre on Valentine’s Day at a high school in Parkland, Florida, are leading a movement against gun violence. A group of students – including some who survived the shooting last month at a high school in Parkland, Florida – led the charge in organising the March for Our Lives, an anti-gun-violence event in Washington, DC, on Saturday emulated in hundreds of cities and towns across the country and around the globe. They were joined on stage by many others who’ve been touched by gun violence, including young people of colour whose communities have been disproportionately affected. In the weeks since the shooting at Marjory Stoneman Douglas High School that left 17 people dead, some of the young activists have become targets for right-wing conspiracy theories and viciously criticised online by people, including lawmakers, who disagree with their positions on gun regulation. Meet some of the young people leading the movement against gun violence, dubbed #NeverAgain. Emma Gonzalez, an 18-year-old senior at Marjory Stoneman Douglas High School, has become one of the most prominent faces of the student-led anti-gun-violence movement. After the Valentine’s Day massacre, Gonzalez and other student survivors began working to contact politicians, advocate legislative change, and organise the march in Washington. On Saturday, she affirmed the Parkland students’ commitment to shedding light on the daily gun violence that disproportionately affects communities of colour but doesn’t receive as much attention as mass shootings. 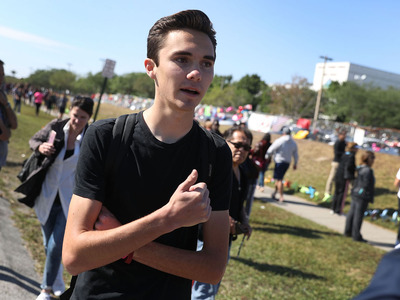 David Hogg, a 17-year-old student at Marjory Stoneman Douglas High School, has also become a national face of the anti-gun-violence movement, giving multiple interviews to national news outlets and speaking at several events in the wake of the shooting. Naomi Wadler, the youngest speaker at Saturday’s march in Washington, provoked an enormous reaction from the crowd, celebrities, and politicians. “My friends and I might still be 11, and we might still be in elementary school, but we know – we know life isn’t equal for everyone, and we know what is right and wrong,” she said to thunderous applause. Cameron Kasky, a student at Marjory Stoneman Douglas High School who’s involved in theatre, began speaking out shortly after the shooting, which he and his brother survived. Kasky began speaking with national news outlets and joined the group of students leading the public response to the shooting. “Welcome to the revolution,” Kasky said to cheers on Saturday. Edna Chavez, a 17-year-old from South Los Angeles, spoke at the rally on Saturday about her brother, Ricardo, who was in high school when he was shot and killed.